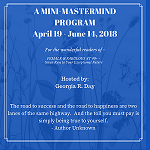 This program is designed to give you the tools, guidance and support to learn ways to explore your true passion, determine where you fit in the balance of your life to be fulfilled in ways that satisfy you, learn the secrets to designing a life that touches your spirit, ignites the flames of hope and so much more. Program and discussion groups in one place online. Two calls each month & weekly updates. NOTE: Shopping cart checkout is handled by PayPal (you don’t have to have a PayPal account). No credit card or bank information is collected by Kamama LLC.